OTHER USES: This section contains uses of this drug that are not listed in the approved professional labeling for the drug but that may be prescribed by your health care professional. Use this drug for a condition that is listed in this section only if it has been so prescribed by your health care professional. This medication may also be used to treat nerve pain. HOW TO USE: Read the Medication Guide and, if available, the Patient Information Leaflet provided by your pharmacist before you start using venlafaxine and each time you get a refill. If you have any questions, ask your doctor or pharmacist. Take this medication by mouth as directed by your doctor, usually once daily with food, either in the morning or evening. Do not crush, chew, or dissolve this medication. Doing so can release all of the drug at once, increasing the risk of side effects. Also, do not split the tablets unless they have a score line and your doctor or pharmacist tells you to do so. Swallow the whole or split tablet without crushing or chewing. If you are taking the capsules, swallow them whole. If you have trouble swallowing the capsules whole, you may open the capsule and sprinkle the contents onto a spoonful of applesauce. Swallow all of the mixture immediately without chewing. Drink a glass of water after each dose. The dosage is based on your medical condition and response to treatment. To reduce your risk of side effects, your doctor may direct you to start this medication at a low dose and gradually increase your dose. Follow your doctor's instructions carefully. Take this medication regularly to get the most benefit from it. To help you remember, take it at the same time each day. It is important to continue taking this medication as prescribed even if you feel well. Do not stop taking this medication without consulting your doctor. Some conditions may become worse when this drug is suddenly stopped. Also, you may experience symptoms such as confusion, mood swings, headache, tiredness, sleep changes, and brief feelings similar to electric shock. Your dose may need to be gradually decreased to reduce side effects. Report any new or worsening symptoms immediately. It may take several weeks to feel the benefit of this medication. Tell your doctor if your condition persists or worsens. DRUG INTERACTIONS: Drug interactions may change how your medications work or increase your risk for serious side effects. This document does not contain all possible drug interactions. Keep a list of all the products you use (including prescription/nonprescription drugs and herbal products) and share it with your doctor and pharmacist. Do not start, stop, or change the dosage of any medicines without your doctor's approval. Some products that may interact with this drug include: other drugs that can cause bleeding/bruising (including antiplatelet drugs such as clopidogrel, NSAIDs such as ibuprofen, "blood thinners" such as warfarin). Avoid taking MAO inhibitors (isocarboxazid, linezolid, methylene blue, moclobemide, phenelzine, procarbazine, rasagiline, selegiline, tranylcypromine) during treatment with this medication and for two weeks before and after treatment. In some cases a serious (possibly fatal) drug interaction may occur. Before using venlafaxine, report the use of other drugs that increase serotonin, such as dextromethorphan, lithium, St. John's wort, sibutramine, street drugs such as MDMA/"ecstasy," tramadol, tryptophan, certain antidepressants including SSRIs (such as citalopram, paroxetine) and SNRIs (such as duloxetine), "triptans" used to treat migraine headaches (such as eletriptan, sumatriptan), among others. The risk of serotonin syndrome may be more likely when you start or increase the dose of these medications. Tell your doctor or pharmacist if you are taking other products that cause drowsiness including alcohol, antihistamines (such as cetirizine, diphenhydramine), drugs for sleep or anxiety (such as alprazolam, diazepam, zolpidem), muscle relaxants, and narcotic pain relievers (such as codeine). Check the labels on all your medicines (such as allergy or cough-and-cold products) because they may contain ingredients that cause drowsiness. Ask your pharmacist about using those products safely. Aspirin can increase the risk of bleeding when used with this medication. However, if your doctor has directed you to take low-dose aspirin for heart attack or stroke prevention (usually at dosages of 81-325 milligrams a day), you should continue taking it unless your doctor instructs you otherwise. 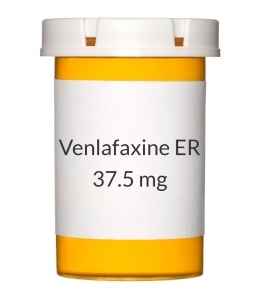 Venlafaxine is very similar to desvenlafaxine. Do not take medications containing desvenlafaxine while using venlafaxine. This medication may interfere with certain laboratory tests (including urine tests for amphetamines), possibly causing false test results. Make sure laboratory personnel and all your doctors know you use this drug.